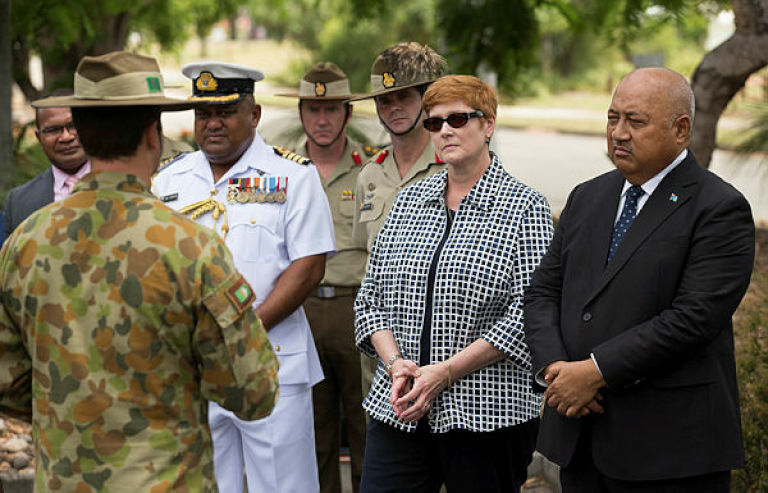 Minister for Defence Marise Payne and Fijian counterpart Minister Ratu Inoke Kubuabola are briefed on Bushmasters during a visit to Gallipoli Barracks in Brisbane in March. Following Fijian Minister for Defence and National Security Ratu Inoke Kubuabola’s visit to Australia, where he toured the Thales Eagle Farm facility after Fiji agreed to purchase Australia’s Bushmaster vehicles, Defence Minister Marise Payne is in Fiji to discuss Australia’s growing bilateral defence relationship and shared regional and global security priorities. Minister Payne will meet Minister Kubuabola and Commander of the Republic of Fiji Military Forces (RFMF) Rear Admiral Viliame Naupoto in Nadi. The visit builds on Minister Kubuabola’s successful visit to Brisbane in March. Minister Payne said the visit marks a significant milestone in the deepening bilateral defence relationship. "Australia and Fiji have a long history of working together in the Pacific region to build national and regional resilience to reduce the likelihood of instability and the impact of regional threats," a statement for Minister Payne said. In the 2016 Defence White Paper, Australia committed to increasing international engagement, particularly with the countries of the south Pacific and south-east Asia, to support collective capacity to address common threats and security challenges. "Fiji is a key regional security partner in the south Pacific and I am pleased that our defence relationship continues to go from strength-to-strength," Minister Payne said. "Our defence forces are increasing their engagement, particularly in the areas of maritime security, humanitarian assistance and disaster relief, and peacekeeping. "This visit is an opportunity to further improve close co-operation on important regional and global issues." Minister Payne will also visit the RFMF Black Rock base, where the RFMF conducts pre-deployment training for its personnel for United Nations peacekeeping operations.